A massive fire engulfed the Notre Dame cathedral in Paris on Monday evening – people around the world watched in horror as the iconic spire collapsed. An aerial shot of the historic cathedral showed widespread damage to the roof, however a photo of the interior of the church revealed that a Cross was still in tact and standing – a miracle! It is also feared that Jesus Christ’s Crown of Thorns could have been destroyed in the blaze. People on social media reacted to this miracle. Of course the cross is still standing. The post AMAZING! 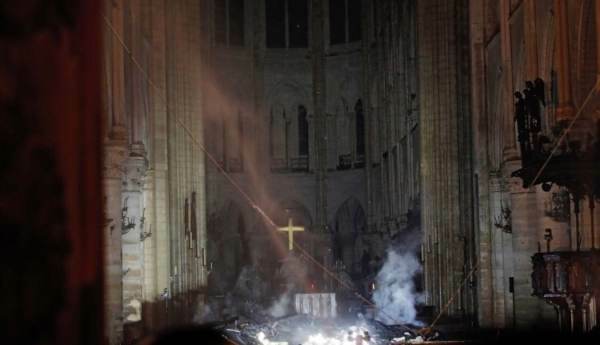 Interior Photo of Notre Dame Reveals Cross STILL STANDING After Massive Fire Engulfs Cathedral appeared first on The Gateway Pundit.